We’re very excited to be launching our newest plan in and around Skiff, Conrad and Legend! We’ve expanded service in cooperation with 40 Mile Rail, who has partnered with us to leverage their unused telecommunications tower. The new “Skiff” tower is located within the hamlet. CCI now offers all of our wireless plans within 15km of the new tower. We can deliver our “Ultra Plan*,” 20 Mbps download bandwidth and 2 Mbps upload bandwidth, which quadruples our current top speed in the area. The area used to be served mainly by our Foremost and Wrentham towers. 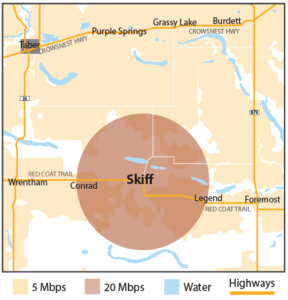 Existing customers within the coverage area can switch to Skiff tower to receive upgraded service. To celebrate the launch, we have special offers available to new and existing customers! Sign up before November 17th 2018, and you’ll receive a totally free installation. If you need additional height to reliably reach the signals from our tower, we’ll cover the cost for a “tripod” on your roof. You need new equipment to connect to faster plans. Book before November 17th 2018, and get your upgrade for free. Your first three months of 20 Mbps are discounted – pay your current rate! 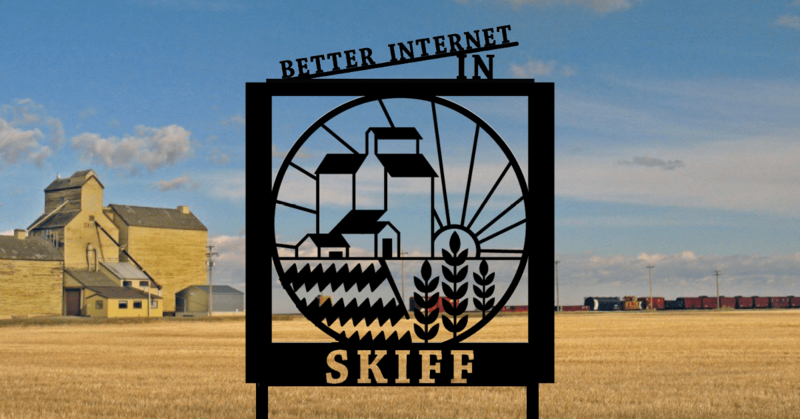 *The Ultra plan is not yet available everywhere CCI serves – this upgrade to Skiff is part of our plan to deliver higher speed plans across our network.